DON'T CROSS- This was an old sign used on the pedestrian pushbuttons before the present day enamel ones. It kind of got the point across better I think, than today's "To Cross Street" ones. STOP- YOU ARE DRIVING THE WRONG WAY- This sign just about says it all -- short of saying "you idiot." This is a fairly old one from a Southern California freeway off ramp that must have had a "Wrong Way" problem....these are pretty rare. STOP WHEN SWINGING- No, this isn't a "lifestyle" reference...It was a sign used in the "old days" on the wig-wag signal at many railroad crossings in this country in the 40's and 50's. the signal had a red light in the middle of a round disc and swung like a pendulum back and forth when a train approached the crossing. 4-WAY STOP SIGN- It is stamped metal with an enamel finish. The words "Four - way" appear on the sign itself. This sign is probably from the early 50s. ROUTE 66- This is one of the "cat eye type" original route 66 signs. This particular one marked the route in eastern Oklahoma. Some of these signs also had the state name or "US" at the top marked with reflector buttons. These are very rare today, and if one is being sold it usually runs close to $1000! HISTORICAL LANDMARK- This sign is used in California to point out different sites of historical interest. It has kind of an unusual shape, and has the "bear" image prominently displayed at the top. This particular sign pointed the way to landmark number 75, the "Casa de Cota" site. WATCH FOR LIVESTOCK- An old AAA text version of the "cow symbol" sign used today. This particular one was used in the Mojave Desert and proceeded a very old cattle guard made from old narrow gauge rails. This sign endured many a bullet hole and desert flash flood. It is one of those signs that just makes me wish it "could talk". YIELD RIGHT OF WAY- This old yellow sign with cat eye reflectors was pretty typical of the yield signs of the 1940's. The sign had curved edges and explained the whole message of what the motorist was expected to do. I think that this message should never have been dropped on the newer red and white signs because many motorists haven't quite figured out what just "yield" means! CAUTION-RATTLESNAKES- Typical sign used at rest areas along the desert interstates. It definitely captures your attention! NEVADA 1-A- This is an old state route sign that was posted in about 1940. It was used on the old route between Fallon (US 50) and I-80 (US 40) which is now US 95. NO PARKING OR DRIVING ON SIDEWALK- I'm not sure of the conditions that led up to the posting of this sign but I'll bet it was an interesting story! This sign is from the 50s. OREGON 99W- Here is a typical 1950s Oregon State route marker. It shows the eagle symbol at the top of a "trophy shaped" sign. KEEP RIGHT W/ LEFT ARROW- This unusual sign was the result of the sign maker's not paying attention. In fact, it got all the way to the point of being mounted before the mistake was discovered! This one would cause great confusion for sure! NO SHOOTING- This would be an interesting sign to encounter while driving down the highway. One might even think twice before heading into town! The "No Shooting" sign at the top looks fairly intimidating as it's riddled with bullet holes! WATCH FOR ICE ON BRIDGE- Kind of a unique sign in that it can be folded seasonally so that it is not visible in the warmer months. Sign folds in half and can be secured with the lower mounting bolt. This just a small example of my collection of over 500 road signs. This particular example shows some of the regulatory signs I have. OLD AAA SIGN- This sign is one of the oldest signs in my collection. It is dated from the 1930s and marked the way to San Diego. These signs are also very rare and expensive. Funny thing about this sign, I picked this one up just before I did the event mentioned above in San Diego. Excellent timing! AAA DIRECTIONAL SIGN- Here is an example of a more recent AAA sign from the 40s. Note the unusual yellow logo at the bottom. Most AAA logos on signs from this era were only black-and-white. Another great directional sign; this one from the Automobile Club of Southern California. This sign was able to withstand several bullet wounds, but many of the old Auto Club signs weren't as lucky. Usually as soon as the porcelain is damaged, it is only a matter of time before rusting begins and the porcelain starts to chip and flake away. Eventually, the signs would wear away until they would become unreadable. SLOW LEFT- Another old Auto Club sign from the 1920's. This one was printed in red, so as to warn motorists of the upcoming curve. It is an example of one of the first attempts at distinguishing a warning sign from others. SLOW/ DANGEROUS CORNER- Many early Auto Club signs of the 20's used word descriptions to explain hazards that are represented by symbols today. Unfortunately, these worded messages could be quite vague. This particular sign emphasizes a "dangerous corner". It lacks the specific information as to the reason for the danger or which corner! NO PARKING ON THIS STREET- An early example of a temporary sign that the police used to clear traffic for a special event. The sign is made of a very thin metal (almost tin-like) and had double holes on the top and bottom to make it easier to mount with wire to poles or trees. One interesting note: The sign spells "today" as "to-day". Must have been the way it was spelled in the early 1920's! WINDING ROAD- Don't see many written message signs like this any more. Unfortunately, these unique messages ("Dangerous Curves" is another one that comes to mind) gave way to the "winding arrow" symbol early on. BEGIN DETOUR 400FT-Another of the more unusual old signs illustrating the use of yellow warning signs before orange became the standard for construction zones. RAILROAD CROSSING- A great old highway sign with reflector buttons and the Auto Club of Southern California Logo at the bottom. This is an older version sign as noted that screws are holding the back panel that holds the buttons in place as opposed to rivets in later years. SPEED LIMIT 25 MILES- Great example representing a typical Auto Club sign of the 40's with the glass marbles lining the "25" and the spelled out Auto Club logo. Almost every town in Southern California had one of these posted along their residential or Central Business District. The marbles are placed inside two compartments in the back. These compartments make the sign a bit thicker in back, but they are separated enough, that the sign is mounted without obstruction. LEFT TURN SIGNAL- This sign represents the first of a family of signs distinguishing one type of signal from another. Typically this was mounted beside or below the signal that used the green left turn arrow indication, in addition to a circular red and yellow. This sign is in remarkably good shape for it's age (new old stock) and probably never saw street use. The logo on the bottom is from the California Division of Highways. HOSPITAL- Another sign from the Automobile Club of America as recognized by the yellow diamond logo. When I received this sign originally, it was blue with white letters (like a typical info sign is today). Then later (after several rain storms), the blue began to peel off, revealing the original black paint beneath! ONYX- This sign was once placed at the entrance of the tiny community of Onyx. Ca. located in Kern County. The community today is not in existence anymore. It was named for the type of mineral that was mined here. This sign was produced by the California Department of Public Works- the predecessor to Caltrans. LONG BEACH CITY LIMIT- An old California Division of Highways sign that stood at the city limits. When the population changed enough to update, the sign would receive a small porcelain overlay that would be screwed on to reflect the new number. DRINKING FOUNTAIN 500 FT.- Many early auto club signs directed weary travelers to water...both for the vehicle, and in this case for the motorist! Drinking fountains were not a very common commodity along the highway...which makes this sign quite unique! MUNICIPAL PARKING LOT 1 BLOCK- Another ACSC sign in excellent condition for it's age. This sign would normally be used on a main street to point the way to the local downtown lot. NO PARKING DURING SCHOOL HOURS- This is one of the unique specific parking signs that the ACSC would erect. The odd thing thing with this style of sign is that times weren't given. You had to know when the school hours were, and know not to park during that time! When I received this sign, it was still mounted to the top part of the original post. The wooden post was painted white and tapered to a point on top. 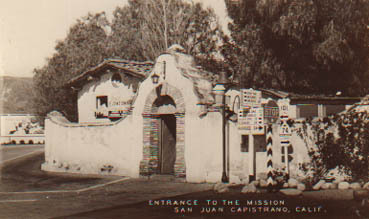 END 74- This sign was posted in San Juan Capistrano, California.....right next to the old mission. It is a pretty old one from the 1940s, complete with the "California Bear" at the top and ACSC symbol on the bottom. The next few pictures show some of the Auto Club porcelain signs that I have in my collection. In all, I have 37 signs of this type. Some of them have glass or plastic "cat eye" reflectors in them. This photo also shows some of the signals and other items that I collect. In addition to the signs, this picture shows my Crouse-Hinds 4-way signal and also a railroad wig-wag. Old curve sign with reflectors and amber beacon.